Photography equipment is alluring stuff and having a bag full of it is something that a lot of us wish for. However, when you are faced with trekking to the top of a hill to catch the sunrise, or a night out in the wilderness in pursuit of a Milky Way photo, lugging all that gear around rather takes the shine off all those trinkets. 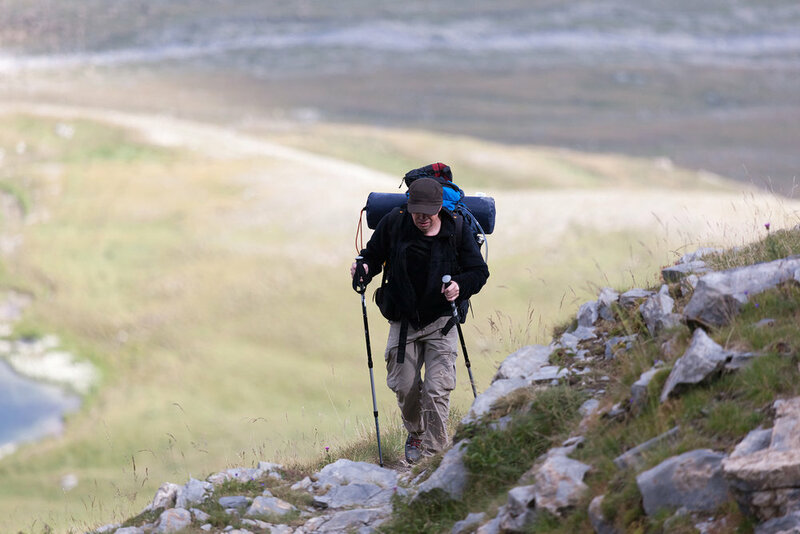 Glass is heavy, and carrying it means negotiating the fine line between enduring and enjoying your excursion! My bare minimum – (clockwise) A Canon 5d Mk iii, EF 24-70mm f/4L IS USM, Lee Circular Polarising Filter, Lee Little Stopper ND Filter and a Sirui N-3203X Tripod with Sirui K-30X Ball Head. It goes without saying that no photography takes place without a camera and unless you happen to be a brand ambassador for one of the camera manufacturers or, alternatively, happen to be wealthy enough to possess a cache of photographic implements, then the camera you carry is the one you own. Recognising this little home truth is important, and difficult, especially at the beginning of one’s landscape-photography journey. Faced with propaganda from the likes of Canon, Nikon, Sony and so on, it is easy to get wrapped up in specs and features and to forget that which is really important. The fact is that no landscape photography happens without first having a landscape to look at and very few (if any) celebrated shots have ever been taken through the window of a car. Frankly, unless you are truly gifted or unduly lucky, then from day one, the day when you finally decide on your weapon of choice, you are going to have to carry that camera on your back. Any weight it adds to the equation must contribute to the quality of the final images, otherwise you’re simply wasting energy. As is often the case when someone sprouts unsolicited wisdom, I didn’t follow my own counsel during my formative steps into the landscape-photography arena. 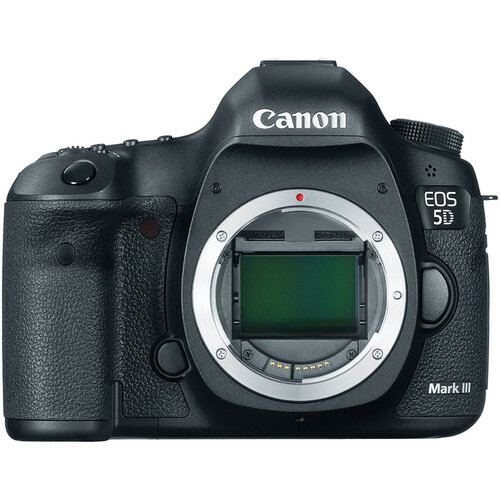 Instead, intoxicated by the mere thought of owning a DSLR, I invested heavily into the Canon EOS ecosystem and today, I pay for my naiveté by dragging around a 5D Mark III. Don’t get me wrong, the 5D is a superb camera capable of taking exquisite pictures, but it is also one that essentially embodies the word brick. Truth be told, I seldom go out into the field with only one lens but, when circumstances demand that I travel light (think multiday hikes and so on), then the choice of a single lens that is best for the job becomes almost mandatory. Personal taste and style will, of course, weigh heavily on the outcome of any such evaluation but there are a few general points to keep in mind. First, fast lenses may be near the top of photography’s ‘cool wall’, but they are also heavy. Canon’s EF 24-70mm f/2.8L II, for instance, is a very highly regarded piece of optical engineering that weighs in at a hefty 805 g, while its cousin, the EF 24-70mm f/4L IS USM, tips the scales at just 600 g. Wider apertures mean more glass which, in turn, means more weight and while 206 g might not sound like a significant difference, you’d probably find it difficult to hold on to that belief while gasping for breath somewhere near the summit of a Drakensberg peak. Furthermore, it would be prudent to ask yourself whether you really need the capability that an f/2.8 or similarly porky large-aperture lens offers. Landscape photos classically require that the images be sharp front-to-back and that means stopping down. It would be a shame to sweat, dragging a f/2.8 lens up the side of a mountain only to then use it at f/16, a common landscape-aperture setting. The second, more subjective matter is focal length, and the reality is that all decisions in this respect will be a compromise. By choosing a single lens you are effectively limiting your options; so, to ensure that you give yourself the best possible opportunity for success, nothing beats research. Looking at photos that other photographers have taken and estimating the focal lengths they used is a sure way to reach a location with the correct gear in your bag. Finally, common sense goes quite some way towards guaranteeing focal-length success. 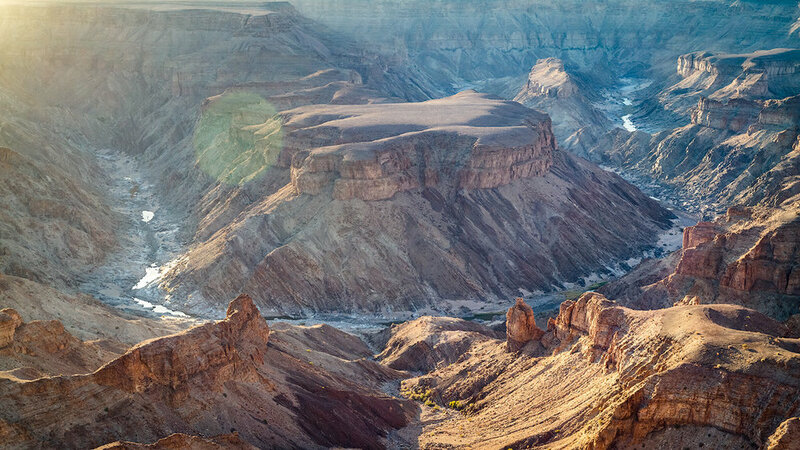 It would be a touch irrational, for example, to visit the Fish River Canyon with only a long lens when photos taken from the edge of the valley as well as those taken from within are likely to require a wide-angle approach. In the same vein, you’d probably want a longer lens when walking in the foothills of a mountain range so as to ensure that any imposing peaks remain imposing when seen in the final photo. For me, the single-lens decision almost always comes down to a choice between the Canon EF 16-35mm f/4L and the Canon EF 24-70mm f/4L. Both these lenses are superb companions but a quick look through my catalogue suggests that the 16‑35mm has done the most work for me over the years. There is always an argument to be made against the need for a tripod. They are heavy, unwieldy pieces of equipment that are not a prerequisite for good landscape photos. However, given that capturing images of the highest possible quality requires a perfectly still camera, and that a good portion of landscape photography takes place in the dim glow of dawn and dusk, there can be no denying that tripods allow photographers the opportunity to shoot during what is arguably the most productive periods of the day. With shutter speeds that are frequently measured in seconds, unless you have the peripheral control of a living-statue street performer, you are going to need a tripod! My choice is the carbon fibre Sirui N-3203X. Being carbon fibre saves a few grams, but it is certainly not an essential tripod characteristic. To read more about this tripod and why I bought it, click here. The use of optical filters at all is itself a contentious topic in photography circles and much of the debate boils down to which filter effects can be accurately reproduced during post-processing and which can’t. In many cases, for example, the product of graduated neutral density filters can be mimicked in post-production without such a filter ever having been fitted to the camera. By contrast, it is impossible to retroactively reproduce the effects of a polarising filter. It is this distinction, between what I can and can’t do behind my computer, that dictates what I carry, and the result is that you will always find me with a circular polarising filter and 6-stop neutral density filter. 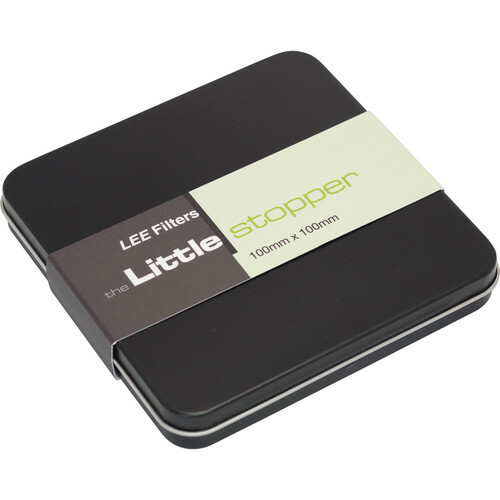 The Lee Little Stopper, a 6-stop neutral density filter. Rounding off my list of gear that always makes its way on a trip with me are spare camera batteries and a remote shutter release. The motive for carrying spare batteries should be self-explanatory, although it is worth me pointing out that using a camera in its Live View shooting mode requires a lot of power. I’d rather carry an extra battery than spend a day carrying a brick that doesn’t work for lack of electricity. By comparison, my reason for carrying a remote shutter release is distinctly subtler. Using a remote shutter release only improves ergonomics but given that the device weighs almost nothing and that it makes the photography experience more pleasant, I’m happy to bear the extra burden every time!